Are you looking for your next affordable MFP that delivers professional color quality? The Ricoh SP C360SFNw Color copier comes at an affordable price and produces up to 30 pages per minute, whether you’re printing color or black-and-white documents. Small offices and work teams can easily manage their daily tasks, becoming more efficient with the increased versatility with this copier device. This amazing copier delivers high-quality 1200 x 1200 dpi resolution documents to impress customers with professional-quality brochures, presentations and more. And with fewer moving parts than laser, LED technology lets you present your ideas clearly with sharp text and graphics. The SP C360SFNw goes a step further to save you time with added scan, copy and fax functions. The Single Pass Document Feeder (SPDF) offers quick scanning speeds of up to 60 images per minute so you can scan two-sided documents in a single pass and load up to 50 pages at a time for uninterrupted scanning. With a separate toner and drum, you can save money by replacing each component separately, only when it’s completely depleted. 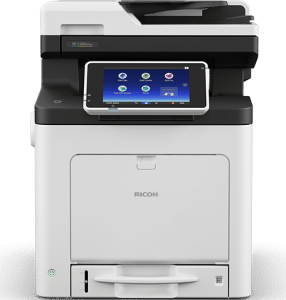 The Ricoh SP C360SFNw Color copier is super robust and can easily produce volumes of at least 1,000 pages per month without sacrificing quality.